PARKLAND, Fla. — They solemnly spilled onto the high school football field, holding signs protesting gun violence and wearing shirts that read "March for our lives." They waved at a crowd of onlookers who had gathered to show support. Exactly one month after 17 people were killed at Marjory Stoneman Douglas High School in Parkland, survivors of the massacre joined tens of thousands of students across the U.S. by walking out of school on Wednesday morning. The mass protests were held at 10 a.m. local time in each time zone and lasted 17 minutes, one for each of the Parkland victims. Organizers said the purpose was to highlight "Congress’ inaction against the gun violence plaguing our schools and neighborhoods." An estimated 185,000 people in 50 states were expected to join the walkout, with around 3,100 schools planning to participate, an organizer with the Women's March told NBC News. The marches ranged in size. At Terre Haute North Vigo High School in Terre Haute, Indiana, organizer Elisabeth Downing said over 60 students stood in silence, many wearing orange — the color representing support for tighter gun laws. "No matter what you decide the action to be, we just want action," said Downing, a senior. "We’re tired of thoughts and prayers, and we’re ready to finally do something." In Rhode Island, where a nor'easter on Tuesday dumped up to a foot of snow in some places, students weren't able to march outside. About 250 students at Pilgrim High School in Warwick instead walked from their classrooms to the auditorium. "That could have been us. We were the same age as the Parkland kids," said a co-organizer, Karly Evans, a senior. "It was a very emotionally moving experience to be part of." Emily Lower, a senior from Central High School in St. Joseph, Missouri, said a few hundred students showed up to the walkout — "way better than we expected." “I couldn’t wipe the smile off my face," she said. "To see that many kids engaged and what their voices could accomplish and seeing the masses, it was an incredible feeling." At Columbine High School in Littleton, Colorado, the walkout lasted 30 minutes — 17 minutes for the Parkland victims, and 13 for each victim of the massacre at the high school in 1999. During the half-hour of silence, students released red, white or blue balloons, one at a time, in memory of those killed. In New York, some protesters gathered outside Trump Tower, including Cinthia Sierra, a 16-year-old from the Leadership and Public Service High School in downtown Manhattan. "It literally can happen to any school, anywhere in the country. School should be a place that's safe. It felt like we're all using the voices that we have," she said. Not every school was supportive of people leaving class. In Clayton, Missouri, students were warned they would be given detentions for walking out — but they came out in the hundreds anyway. In Washington, a crowd in the thousands gathered, holding signs toward the White House reading "Books Not Bullets" and "Fire Politicians, Not Guns." At the stroke of 10 a.m., the crowd sat down en masse, their backs to the White House, and then stayed silent for 17 minutes. Afterward, some marched to Capitol Hill to meet with legislators. "The NRA has held Congress hostage for so many years now," Warren told MSNBC. "These young people are here to set us free." 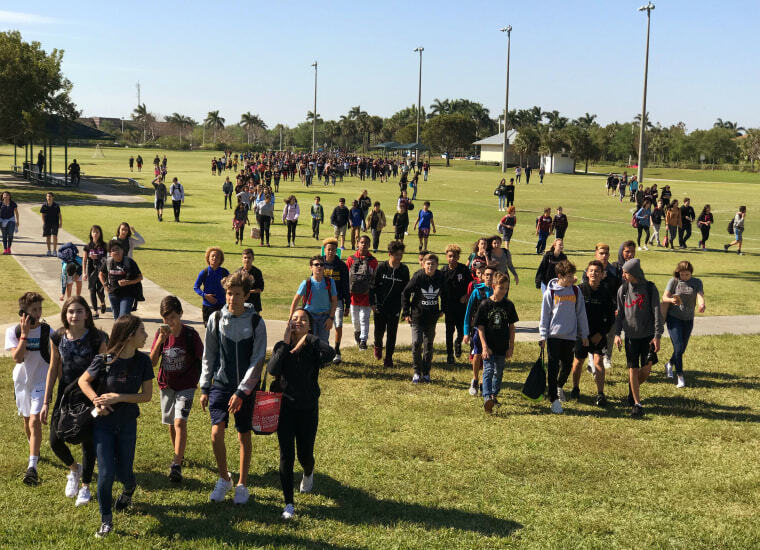 In Parkland, the crowd cheered as students exited the high school and gathered in the center of the football field. Some onlookers yelled "We love you!" to the students. Harrison Sanclemente, 42, of Parkland, held up a white sign with black letters saying "Support our kids." "All they’re asking for is safety. It should be a no-brainer,” he said. After the walkout, a 17-minute prayer service was held at a local park. Anahelena Natera brought her 9-year-old daughter, Ella, who knows Stoneman Douglas students from her drama camp, where many are counselors. Natera said she sees the student-counselors "as friends and I see them as role models — and what role models to have. They're amazing." Heather Taylor, 15, a freshman at Stoneman Douglas who was in the building during the shooting, said Wednesday that she was glad the community had been galvanized by the tragedy. "I just hope we can get better gun control. I hope that happens," she said. "I hope people see we’re really trying and we’re not going to stop." Kalhan Rosenblatt reported from Parkland, and Elizabeth Chuck, Ethan Sacks and Jonathan Sperling from New York. The hashtags #NationalSchoolWalkout and #Enough for Wednesday's protest and gun reform have thousands of tags on Instagram, with users uploading by the minute.